Still unusual, though, to have the corner solid, no? Maybe the glass above the casement is mitered? Other examples occur in the Wiley house kitchen, and the master bedroom at Penfield. Closed, the vertical frames of the two windows meet, and almost appear conventional. Then both windows open out and away from each other, the corner disappears, and you feel like something of a miracle has happened, and the roof is defying gravity. It is one of Wright's most stunning effects, though I'm not sure if that's what is going on with this particular window. The first time I saw this happen at Penfield, I"m pretty sure my heart skipped a beat. To my mind, nothing quite explodes the box like this does. On the recent conservancy event in Minneapolis, the owner of Wiley was speaking about having a group of representatives from a window manufacturer over to tour the house. At some point during the tour, the owner described going over to the kitchen window and revealing the disappearing corner. As he put it, there were immediate enthusiastic responses and questions of how the representatives could do that with their windows. The leader of the group had to say, "Now, now fellas, lets not go crazy." Wrighter....thanks for the insights and the interesting story. Doesn't Fallingwater have some of those disappearing corner windows as well? Yes, the steel casements open from each other at the corner of the "glass tower" of kitchen and bedrooms. 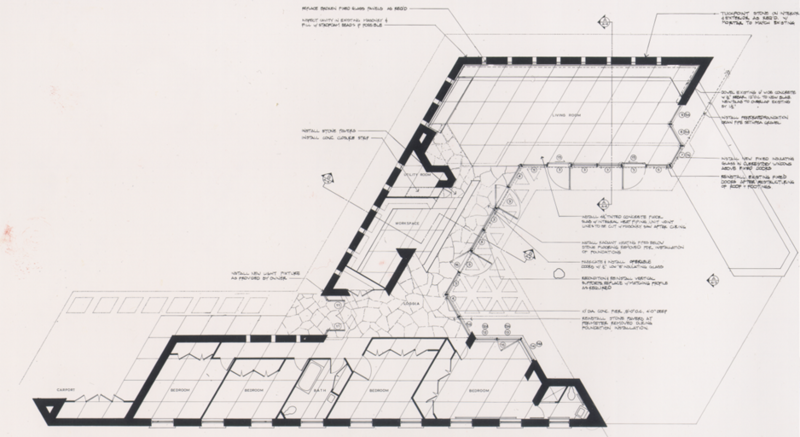 In the Richard Smith house, only one of the windows at that corner operates -- according to the floor plan displayed by outside in on the previous page. The operating lite is hinged to the corner mullion, for some reason. . .
A most unusual detail for FLLW, and perhaps more evidence that he did not not design the house. If the opening sash had been hung on the other mullion he could have still mitered the glass at the corner. I was under assumption that the mitered glass (or the double window opening) was almost a standard detail in the late Usonian houses. Am I mistaken in thinking this? I would contend that the double corner window or door opening was a relative rarity, while the mitered corner glass was almost universal. I wonder what the statistics really are. . . Yes, it does. In fact, between Fallingwater and the end of the career, there are more than two dozen houses with double-opening corner sash, somewhere. Relying on W A Storrer's drawings, we don't find the bedroom operating sash at R Smith which started this discussion, however. . .! Did Storrer miss it, or did outside in add it in the refurbishment ? Well, here's my list of double-opening sash (or doors) at corners. Question marks indicate that I'm unsure whether there's a stationary corner post -- in a couple of cases Storrer's drawing leaves me unsure. Wingspread -- servants' wing, playroom, other ? Auldbrass -- cottage, other ? The list peters out near the end, as you see. 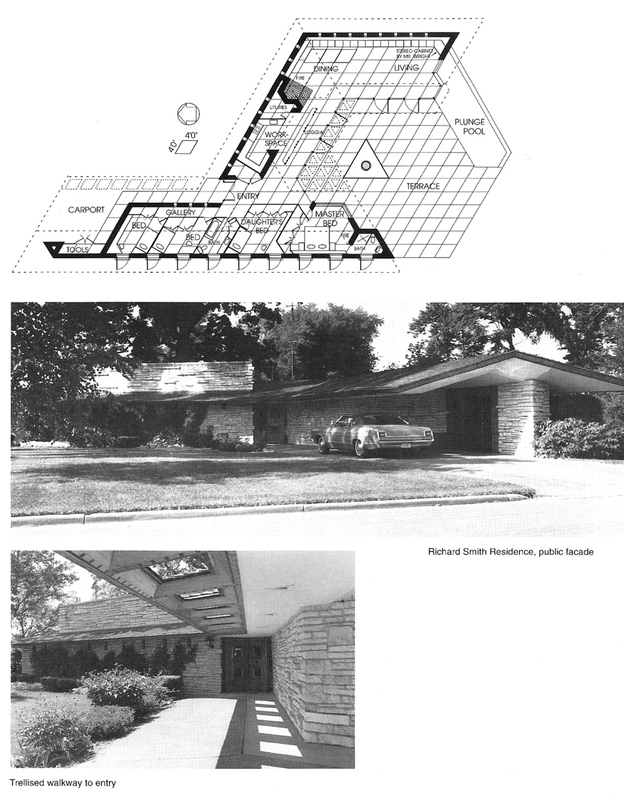 . .
Schwartz, Weltzheimer LR, Erdman prefabs, Gordon. . .
As you say, it's surprising to find one at the Smith bedroom. Can anyone think of a 30/ 60/ 120 degree house which does not have mitered glass? 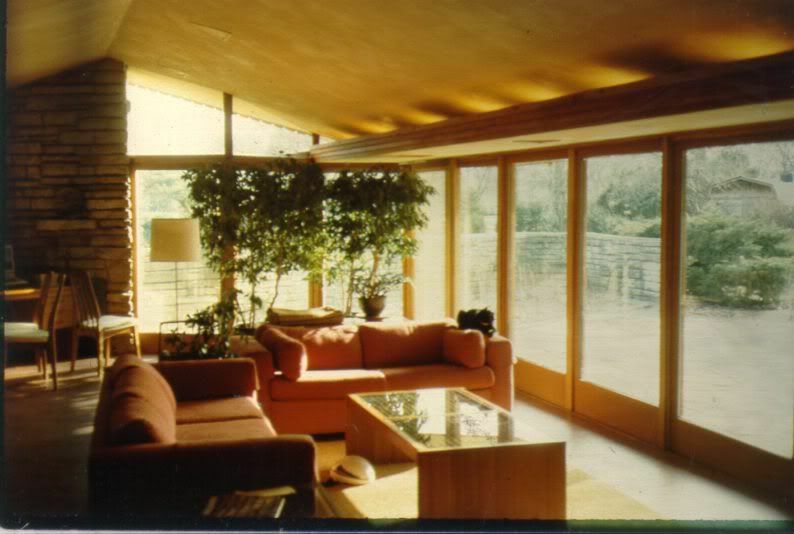 Wall has pairs of french doors at four of the points of the hexagonal living room. When closed they would appear as solid post corners. Other than that, I don't think you'll find an example. . .
Is it possible we are looking at a contractor deviating from the plans or Wright's intention in the Smith example, one perhaps who just couldn't let go of that vertical support, however, unnecessary? In looking through SDR's list of homes with double-opening sash (or doors) at corners, I, for the first time, focused some attention on Weisblat. The house seems to have several unique and, I would imagine, nice features - such as the screened pergola, the enclosed yard, the double-opening doors, two fireplaces, and a workspace that is not enclosed (it has 3 points of ingress and egress). These features even seem more unusual given that they are found in one of the "lower cost" Galesburg homes. The original design looks nice. I'm not sure what Howe's extension did.